I’ve been shooting the FAB Defense KPOS G2 a little further on my Glock 17 lately, and I have some follow-up thoughts and findings. First: it’s not compatible with iron sights that go forward of the rear sight cut, to include many, many of the fiber optic sights out there such as the Tru-Glo TFX. I have not tried it with suppressor sights. Second: I tried using my Tactical Solutions TSG-22 22lr conversion with it. The conversion sits slide sits low enough that I would be VERY concerned about striking the “compensator shroud”. You could, in theory, remove the shroud to make it work correctly, which might be a viable alternative in some setups. The charging handle mechanism is also a little suspect with it, but it does seem to work. I might experiment with this more later on if I have time. Third: an extended magazine release helps a lot with this setup. I highly recommend one. Fourth: it seems like your gun gets very dirty VERY quickly in this enclosure. My front night sight was blacked out after a few magazines of shooting.. Finally: I am still concerned about this gun’s ability to retain a true zero due to the slight up-down movement that you can get with the flexing of the frame. My groups are larger than I would have expected, albeit this is when shooting at 25yds with trash ammo. Now, the truth is, since the front of the gun is latched in pretty good, it might look worse than it is, since the back is going to show a larger flexing due to variance. Still, it’s not what i would call a precision weapon compared to a “real” rifle. It does seem to more-or-less hold zero between taking the gun in and out of the chassis, though. So, in an effort to align content with my current activities, I’d like to talk about my recent experience with putting a compensator on my Polymer80 940C not-a-Glock build, hereon described as my Compact Fauxland Special (CFS). It was built with a Brownells slide with RMR cut, LWD frame parts kit, BCA threaded barrel, Glock slide parts kit, and a TLR-2. After a bit of lube, it was fully-functional and reliable. I decided to get clever and add a TBRCi stubby compensator to my CFS… and that it where my problems all began. So, today, I’ve got something VERY special for you. Courtesy of reader Marcin at POLARMS, I am pleased to show you pictures of a true unicorn: an IMI Magen-1. The Magen-1 has been a real mystery to me. There is a single reference to it online, with basically no useful information other than “it’s 9mm”. Well, now we’ve got pictures, and they tell a lot more of the story. More after the break! Yes, that’s an actual unfired, mint-condition IMI Compact 945 (which I’ve previously erroneously called the 945 Compact) you see in the picture. 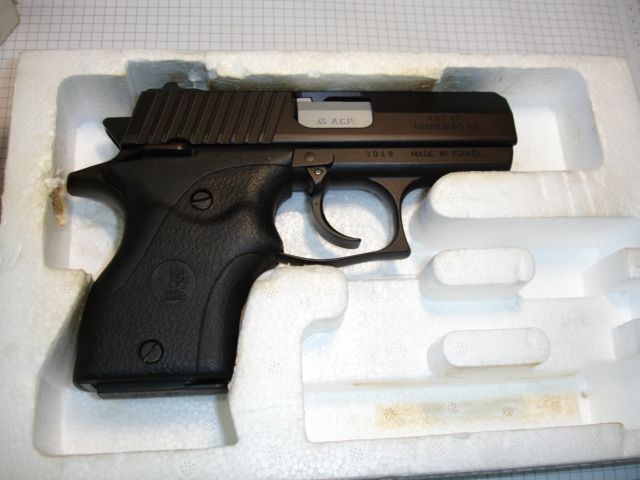 You’ll recall this pistol from the article I wrote on it previously. The Compact 945 did make it into the wild, at least in a limited way. Before I go any further, I want to acknowledge reader “Patrick from Belgium”, with the photos and manual you see in this article, not to mention some other contextual information that’s probably at least as important. The good stuff is after the break! Thanks to a GunBroker seller (Ed at Lear Firearms in NH) who unearthed a pair of Kareen Compacts and was kind enough to share detailed pictures with me, we have a lot more information on those guns now. 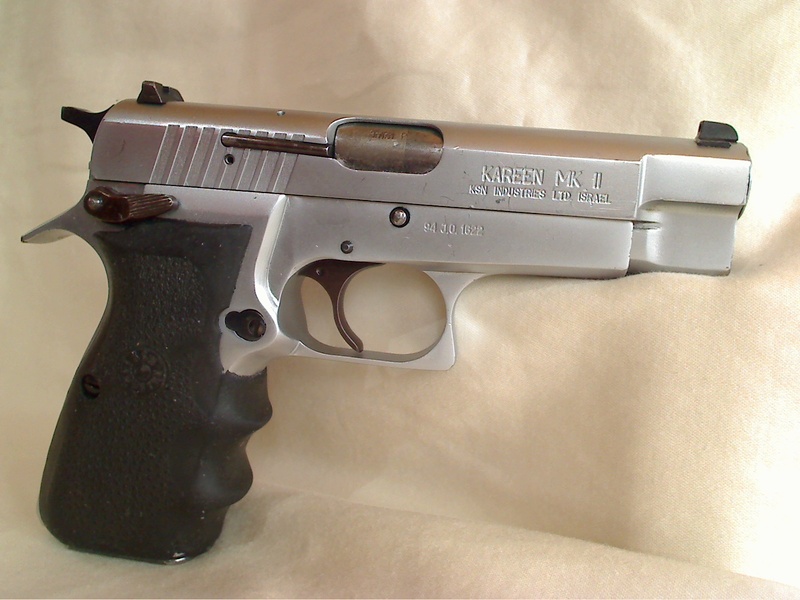 The Kareen Compact is a bit of a unicorn, and a mysterious one at that. Not quite as rare as the IMI 9mm Revolver or 945 Compact, but probably about as rare as the transitional Baraks, which is saying something. Until now, I had only seen one other. More info after the break!